The ballots went out on Monday, Feb. 24 and as of the writing of this article only 5.54 percent of CASE members have voted! We really want to beat our high which is 21 percent. If you cannot find your ballot email, please contact me and we can check. It may be a function of you having a different email from what CEC has on their records or it may mean your membership has lapsed. We get our member list from CEC. If you didn't get your ballot, you may be missing other very important information! Just because you are receiving this email does not mean CEC has your correct email address. You can find the candidate information now on the CASE website but remember, you can only vote from your link in your email. If you know of CASE members who do not get emails, they can contact the CASE office and receive a paper ballot. The election will only be open through Saturday March 15 so don't put it off. Take your turn and be an engaged and informed member! The election results will be announced at the Annual CASE Member/Board meeting at the CEC convention, Wednesday April 9. I hope you are making your plans to attend the CEC Convention and if so, that you are planning to arrive early enough to have breakfast and attend the CASE meeting. Watch for more details in the coming weeks — see below for the CASE Night tickets! What an amazing 3rd Annual CASE Hybrid conference we had last week! Special thanks to our virtual sites who sent in comments and questions! All three days were filled with information and insight. You can still purchase the CD ROM (should arrive in about 3 weeks) and use any of the sessions as often as you like. The handouts and additional information will all be a part of the CD ROM — the only difference is you won't be able to be a part of the discussion. 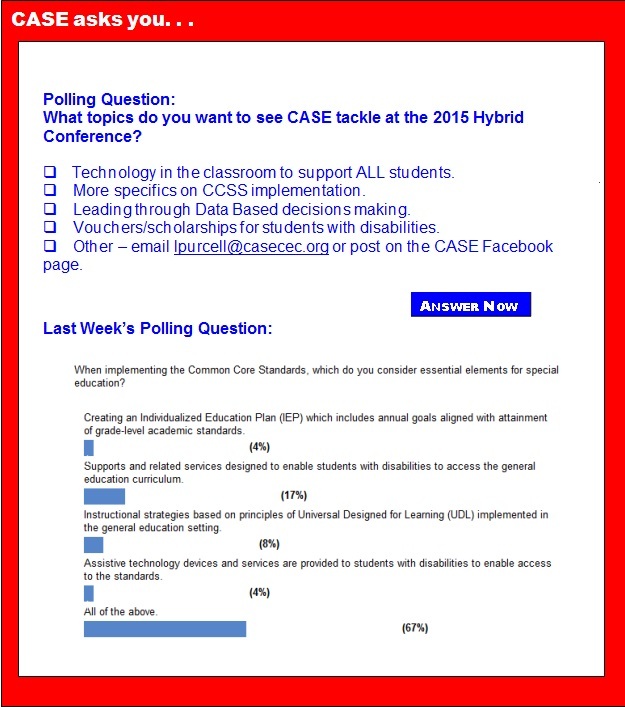 You can go to the CASE Facebook page and/or on Twitter @casecec #2014case and see pictures and discussion streams. Another special thanks to our sponsors and exhibitors for the Hybrid: Sponsors- eSped/eStar; Classworks, and KU Online; Exhibitors: Classworks, Master Teacher and VizZle; what a group of great, dedicated folks! The POLL this week asks for your input on what the topics for the 4th Annual Hybrid should be — no, it is not too early to begin planning for next year! Speaking of planning, I hope you are planning to attend CEC and all of the CASE events! Make sure your plans include you arriving so you can attend the CASE member/board meeting on Wednesday, April 9. We will begin with a great, full breakfast buffet, sponsored by eSped at 7:30-8:30 and then the meeting starting at 8:30 and going until about 4:30. Awards will be sponsored by Stetson & Associates. Once again, this year our Showcase session, sponsored by Scholastic, will be Julie Weather, Esq with her great legal update! CASE Night, co-sponsored by C8Science and Star Autism Support, is going to be a great event as always this year! Just think, heading out to the ballpark with 174 of your colleagues on Thursday, April 10, 2014 for food and a great ballgame! We will have appetizers, dinner, cash bar and lots of fun at a pregame tent party at the Citizens' Bank Park and then we will be sitting together for the Phillies vs. Brewers game! Click here for the flyer and Click here to purchase your tickets! CASE NIGHT sells out almost every year ... don't delay on getting your ticket! See you in Philadelphia! Recently, the Senate Committee on Health, Education, Labor & Pensions and House Education and Workforce Committee both held hearings focusing on high-quality early education, a priority of the Obama administration which the president highlighted in his last two State of the Union speeches. Interning with the Department of Education is a great way to explore your interests in education policy research and analysis, intergovernmental relations and public affairs, and even work with social media while learning about the role federal government plays in education. The Library of Congress is accepting applications for its week-long summer programs for K-12 educators through March 24. Selected participants join colleagues from across the country for five days of high quality professional development in Washington, D.C. Educators across subject areas and grade levels work side by side with Library education specialists and collections experts to develop lessons for use in their classrooms. At the program’s end, participants will return to their school settings armed with multiple strategies for developing, refining, and implementing lessons with primary source analysis at the center. In a recent discussion board thread on reading comprehension challenges in autism, a special-education teacher commented that her students can't understand the assigned reading passages. Mississippi's Petal Primary School students who struggle with learning to read are getting the help they need in the school's dyslexia lab. Principal Kim Raulston installed the lab this school year, in response to the 2012 passage of House Bill 1031, which requires schools to screen kindergartners and first-graders for dyslexia. "For several years, we have been concerned about the needs of students who are learning to read," she said. "Kindergarten students are screened in the spring and first-graders are screened in the fall." The writing is on the chalkboard. Over the next few years, America can count on a major expansion of early childhood education. We embrace this trend, but as health policy researchers, we want to raise a major caveat: Unless we’re careful, today’s preschool bandwagon could lead straight to an epidemic of 4- and 5-year-olds wrongfully being told that they have attention deficit hyperactivity disorder. Introducing millions of 3- to 5-year-olds to classrooms and preacademic demands means that many more distracted kids will undoubtedly catch the attention of their teachers. Sure, many children this age are already in preschool, but making the movement universal and embedding transitional-K programs in public schools is bound to increase the pressure. We're all for high standards, but danger lurks. It's a fact of life in the 21st century that kids are connected to each other 24/7. A generation ago, young people who were bullied in school could count on hours spent at home as a respite from ridicule. Today, kids are ever-connected through texting, instant messaging, and social media sites; sadly, there is little rest for the bully-weary. While many parents consider themselves digital immigrants in their child's native cyber-lands, even a tech-novice can help a young person navigate their way safely through the choppy waters of online aggression. A federal agency and more than 130 members of Congress are calling on President Barack Obama to allocate more funding for special education in his upcoming budget proposal. In separate letters to Obama, the National Council on Disability and a group including both Democrats and Republicans in Congress are asking the federal government to increase special education spending for the coming year and to establish a 10-year plan to fully fund the program. In a recent discussion board thread on reading comprehension challenges in autism, a special-education teacher commented that her students can't understand the assigned reading passages. "When I complained, I was told that I could add extra support, but not actually change the passages," she wrote. "It is truly sad to see my students' frustration." Why must this teacher's students contend with passages that are too complex for them to understand? She attributes this inflexibility to the Common Core, new standards — created in 2009 by a group of education professionals, none of them K-12 classroom teachers or special-education experts — that have been adopted by 45 states. The U.S. Department of Education released waiver monitoring reports for three more states Friday night that show continued struggles with low-performing schools and new tests aligned to the common core. Kansas is dinged because the interventions for its focus schools do not seem to line up with the reasons those schools were selected for this designation in the first place. (Focus schools are those with the largest achievement gaps in the state.) This is a common problem among many waiver states. Tennessee lawmakers will soon consider a bill designed to improve learning for children with dyslexia. Supporters plan to put the finishing touches on the "Dyslexia is Real" bill. It would formally recognize dyslexia as a learning disability. The bill has strong ties to East Tennessee. Emily Dempster of Knoxville has been involved with the bill since the idea started more than a year ago. State Rep. Cameron Sexton, R-Crossville, and State Sen. Becky Duncan Massey, R-Knoxville, filed versions of the bill earlier this month. In the past two decades, the number of children diagnosed with Attention Deficit Hyperactivity Disorder has nearly doubled. One in five American boys receives a diagnosis by age 17. More than 70 percent of those who are diagnosed — millions of children &dmash; are prescribed drugs. A new book, "The ADHD Explosion" by Stephen Hinshaw and Richard Scheffler, looks at this extraordinary increase. What's the explanation? Some rise in environmental toxins? Worse parenting? Better detection? From the early days of the Common Core State Standards, the two national teachers' unions have been among the initiative's biggest boosters, helping to make the case to the nation's 3.5 million teachers for the tougher expectations and putting significant money into the development of aligned curricula and tools. But in some union quarters, that support is starting to waver — the product of flawed implementation in states, concerns about the fast timeline for new testing tied to the standards, and, in at least one instance, fallout from internal state-union politics. Maurice Elias, a contributor for Edutopia, writes: "In its comprehensive case study report on socially inclusive schools, Special Olympics' Project UNIFY identified the common factors across schools that had created a bridge from social inclusion programs to a genuinely positive school climate. The case study findings are here, and I'm also going to share with you key lessons learned that reflect my own work in fostering inclusive settings." Transparency is not a word often associated with education. For many parents, the time between 8 a.m. and 3 p.m. can feel like a mysterious part of their child's life. Questioning students about their school day often results in an unsatisfying answer and not every parent has the time to be in constant communication with their student's teacher. For teachers, transparency can have a distinctly negative connotation. In the political debate, the word is often used in connection to hot button issues like posting teacher salaries and benefits publicly or publishing test scores. And within the school walls, transparency can feel like judgement. Teachers can see principal visits as inspections, not respectful check-ins to offer encouragement and suggestions. Every now and then someone in education policy (Arne Duncan) or education philanthropy (Bill Gates) or the media (Malcolm Gladwell) will say something about why class size isn't really very important because a great teacher can handle a boatload of kids. Not really. A new review of the major research that has been conducted on class size by Northwestern University Associate Professor Diane Whitmore Schanzenbach and published by the National Education Policy Center at the University of Colorado Boulder makes clear that class size matters, and it matters a lot.